Another polish making its debut on the blog is the Switzerland-based indie brand, Cadillacquer. Having discovered Cadillacquer around three years ago (and 20 polishes in), I was instantly captivated by, and feel in love with, the pairing of their polishes' base colors and the color combinations of the glitters, shimmers and flakies. 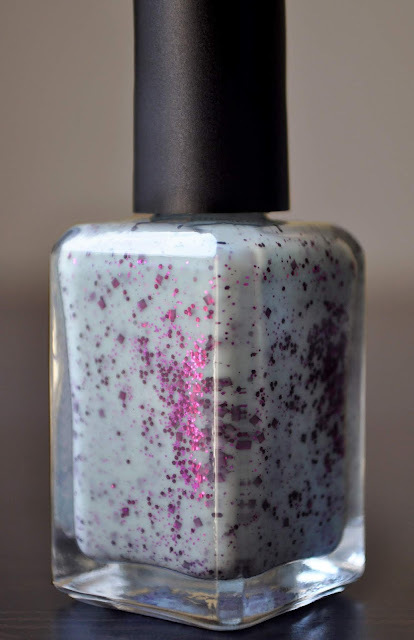 Apricity is a pastel, bluish-mint crelly with various sizes of berry and violet square and hexagon-shaped glitter. The first coat goes on quite sheer. However, here's a great thing about the polish: you don't have to manipulate the brush inside the bottle to get a proportionate amount of glitter on the nails. Although you can get great results with three coats, I prefer the look of a more solid base color, and that extra layer of glitter, I get with a fourth coat. All of which I'm not mad about because the color combo of Apricity is, PHENOMENAL! As with all my other Cadillacquer polishes, Apricity wears flawlessly for 4 to 5 days. Thus, as a public service announcement, glitter polishes, like Apricity, can take some extra work to remove. Cadillacquer polishes are free of Toluene, Dibutyl Phthalate, Formaldehyde, Formaldehyde Resin, and Camphor, and are not tested on animals. I purchase my Cadillacquer polishes from hypnoticpolish.com, color4nails.com, and whatsupnails.com. Keep in mind, whatsupnails.com only permits purchases from within the United States. So, you'll have to email the links to your friends or family in the US in order to get your cadillacquers, like I do. oh wow, I love the look of this! I've only been wearing gel nails when I wear np, but have been missing all the interesting shades. I'm definitely going to poke around those websites to check this shade out. Sissy, is that you? I'm obsessed with Cadillacquer at the moment. I want all their polishes. Did you pick any up? Let me know if you need any recommendations. Such a pretty colour and the glitter shapes are so unique! Never come across a polish with square and hexagon shaped glitters.